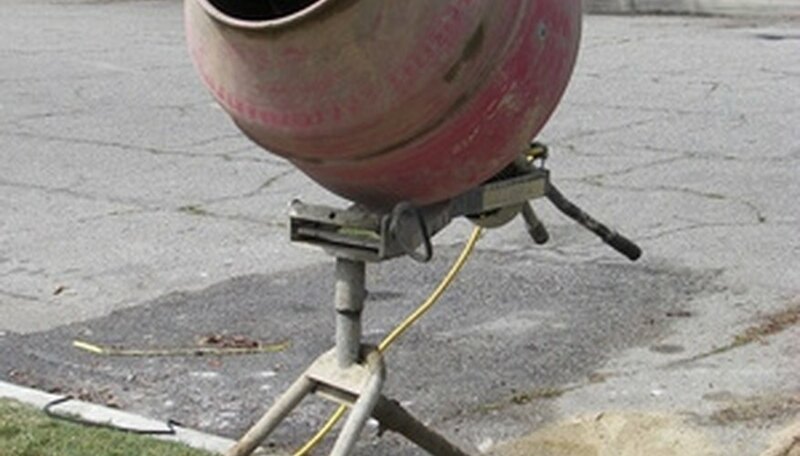 Poured concrete is a strong durable building material, but in order to cover wide surfaces, or support large amounts of weight, reinforcement of some kind is necessary. Reinforcing concrete can be done quickly with little additional work by adding synthetic fibers to the concrete mix. Synthetic fibers, such as glass, added to concrete increases strength throughout the slab. While the strength of the material is increased, the slab still maintains some flexibility that allows for natural expansion and contraction due to temperature changes, to reduce surface cracking. Fiber-rich concrete is difficult to finish, so placing the fibers requires that you follow a specific procedure in order to keep the surface of the concrete workable. Mix a batch of low slump concrete mix thick enough to stand on its own when set into a form. Mix the concrete according to the manufacturer's instructions in a wheelbarrow using the spade. Add any concrete colorants to the mixture if desired. Line the form being used to create your concrete with a layer of the low slump mix 1/8 to 3/16 inch thick. Push the material into place against the bottom and sides of the form. This is the finish layer of your concrete and is required because the fiber strands added to concrete will not create a smooth concrete finish. Mix the fiber reinforced concrete in a concrete mixer. Create a concrete mix consisting of equal parts sand and cement. Add an acrylic polymer emulsion that's five percent the weight of the sand and cement mixture, and chopped AR glass fibers that weigh three percent of the sand and cement mixture. The acrylic helps speed up the curing process of the concrete within the low-slump adding to the strength of the slab as a whole. Add water until the concrete is in a pourable but thick state. Pour the fiber reinforced concrete into the form, inside the layer of low slump mix. Fill the form up to a level that would allow you to place a layer of the low slump concrete on top of the poured concrete the same depth as that used for the sides and bottom of the form. Spread the low slump concrete over the poured reinforced concrete, covering it completely to the level of the top of the form. Work gloves, a face mask, and safety goggles should be worn when mixing concrete to protect against skin irritation or inhaling harmful chemicals.